Pathways are suggestions of courses to consider based on specific career interests. They are structured to help you define your areas of study based on your professional goals. 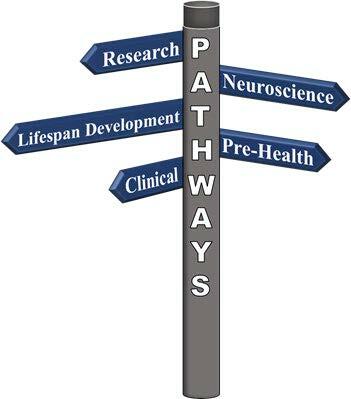 The topic areas include Clinical, Lifespan Development, Pre-health, Neuroscience, and Research. Pathways are not academic requirements and do not result in the award of certificates. You can join several pathways. Your academic advisors can work with you to help guide your course choices. Choosing “paths” may benefit you both in terms of your knowledge of the material essential to entering a particular field and in terms of how you might market yourself to future employers or graduate programs. Ask your advisor if one (or more) of these pathways is right for you. Each pathway has a minimum of 6 courses. Some pathways may have many courses to choose from. Although you will not need to take all of those listed, two to three courses are strongly recommended for each pathway. They are noted with asterisks **. Described below, each pathway includes a few examples of professions that can benefit from that concentration of study. Along with selecting your pathway, we recommend that you also obtain relevant experiences outside of the classroom. Laboratory research and clinical work in hospital settings are examples of valuable experiences. Need a hard copy of this information? Print the summary brochure, or the detailed brochure. This pathway is intended for those interested in the field of clinical psychology or futures as medical professionals, including medical doctors, nurses, and allied-health professionals. PSCL 321. ** Abnormal Psychology. 3 Units. PSCL 325. ** Psychotherapy and Personality Change. 3 Units. Three methods of psychotherapy (behavioral, psychoanalytic, and client-centered) are discussed. The therapy techniques and the manner by which personality change is effected are examined. Recommended preparation: PSCL 101. PSCL 344. ** Developmental Psychopathology. 3 Units. This course will focus on the interplay of biological, psychological, familial, and social determinants of disorders ranging from autism to delinquency and bulimia. Recommended preparation: PSCL 230 or PSCL 321. PSCL 230. Child Psychology. 3 Units. PSCL 317. Health Psychology. 3 Units. Examines psychological processes that affect physical health. Covers the physiological factors affecting the immune system, chronic physical disorders, pain, compliance with prescribed medical treatments, the effects of stress and coping, the effects of the patient-physician interaction, and the psychological aspects of the hospital and the health care systems. Recommended preparation : PSCL 101. PSCL 329. Adolescence. 3 Units. PSCL 334C or 335C. Seminar and Practicum: Hospitalized Children. 3 Units. Supervised field placement and attendance at staff conferences in various child and adolescent settings. Regular seminar meetings. Prereq: PSCL 230 and Junior or Senior Status. PSCL 352. Physiological Psychology. 3 Units. This course is designed to teach the fundamentals of neural communication and central nervous system structure. Special attention is placed on common neurological illnesses and their psychopharmacological treatments. Neural systems underlying sensory/perceptual, motor, and higher-order cognitive processes are also explored. Offered as PSCL 352 and PSCL 403. Prereq: PSCL 101. PSCL 369. Adult Development and Aging. 3 Units. An overview of concepts and research relating to adult development and aging. The lifespan perspective will be used in examining major developmental paradigms. Personality and cognitive lines of development will be traced across the lifespan. Data from both longitudinal and cross-sectional studies will be analyzed. Both normal and pathological aging will be discussed. Special emphasis will be given to areas of cognitive deterioration in aging. Implications for optimal adult development and aging will also be discussed. PSCL 375. Research Design and Analysis. 3 Units. Conceptual and methodological issues confronted by the behavioral scientist conducting research. Major experimental designs and statistical procedures. Intuitive understanding of the mathematical operations. Majors planning to apply to graduate school in Psychology are strongly encouraged to complete this course. Counts as SAGES Departmental Seminar. Prereq: PSCL 101 and PSCL 282 or ANTH 319 or STAT 201 or STAT 201R. PSCL 396. Anxiety and Depression: Symptoms, Etiology, and Treatment. 3 Units. A research-based and writing-intensive presentation of current knowledge regarding the symptoms, etiology, and treatment of anxiety disorders and mood disorders. Counts as SAGES Departmental Seminar. This pathway is intended for those interested in working with people throughout their lives. For example, consider the following pathway if you are pursuing a career in clinical psychology or speech-language pathology. PSCL 230. ** Child Psychology. 3 Units. PSCL 329. ** Adolescence. 3 Units. PSCL 369. ** Adult Development and Aging. 3 Units. PSCL 344. Developmental Psychopathology. 3 Units. COSI 109. Introduction to Communication Disorders. 3 Units. Forty-two million Americans have some type of communication disorder. How does a person with a communication disorder cope with the challenges of daily living? This course will examine the characteristics of communication disorders via first hand and fictionalized accounts in books, films, and simulated communication disorders experiences. Topics will include disorders of speech, language, and hearing in children and adults. Effects of communication disorders on families. COSI 313. Language Development. 3 Units. Language acquisition theory and stages of development of syntax, semantics, pragmatics, and phonology in children. Contributions of biological, social, cognitive and environmental factors to process of language development. Information on language variation in multicultural populations. Open to majors and non-majors. Recommended prerequisite: Child Psychology. Offered as COSI 313 and COSI 413. COSI 345. Communication and Aging. 3 Units. The normal and abnormal psychobiological changes that occur during aging and their effects on communication are addressed, as are communicative interaction styles, disordered communication, and rehabilitation practices. Graduate students are given an opportunity to incorporate information from their own disciplines in a special project, where appropriate. Offered as COSI 345 and COSI 445. Counts as SAGES Departmental Seminar. This pathway is intended for those interested in health-related fields such as medicine, nursing, allied-health professions, and hospital administration, to name a few. PSCL 352. ** Physiological Psychology. 3 Units. PSCL 317. ** Health Psychology. 3 Units. PSCL 379. Neurodevelopmental Disabilities. 3 Units. Ways in which neurobehavioral development can go awry, the causes of such deviations, and their consequences. The course builds on basic psychological and neuroscience concepts to explore the manner in which developmental disabilities occur, ways of preventing disabilities, and approaches to ameliorating and managing disabling conditions. Recommended preparation: PSCL 101 and PSCL 230. Offered as PSCL 379 and PSCL 479. COSI 101. Introduction to Health Communication. 3 Units. An introductory examination of the influences associated with the functions of human life, communication processes, and research related to health and the health care industry from interpersonal, cultural, and organizational communication perspectives. The course will include a review of the history and development of health communication and the understanding and application of communication theories. COSI 200. Interpersonal Communication. 3 Units. Communication is a primary means of initiating, maintaining, and dissolving relationships. Managing interpersonal relationships is a human concern across several contexts. Interpersonal communication is a highly interactive course whereby participants investigate the foundations, processes, and issues associated with communication in relationships. The student will become sensitized to theories and processes via traditional lectures and textbook readings. The student is also expected to participate in group discussions. The result is a continuous dialogue with others about communication processes, and outcomes. The goal of this course is to provide a forum for both investigation and increased competence. COSI 260. Multicultural Aspects of Human Communication. 3 Units. Introduces intercultural/interracial communication by discussing specific communication principles and by putting theory into practice by exploring differences in perception, and verbal and nonverbal communication messages. Course emphasizes relationship between communication, race, culture; nature of race and culture; and how they influence the communication process. Various theories and approaches to study of intercultural/interracial communication will be discussed, along with significant concepts, processes and considerations. Practical outcomes of intercultural/interracial encounters also will be discussed. Counts for CAS Global & Cultural Diversity Requirement. COSI 340. Advanced Health Communication. 3 Units. Various communication processes assume a central role in the acquisition and enactment of health care. This course examines communication activity across a broad range of health care contexts. Attention will be given to provider-client communication, communication, and ethical concerns, persuasive health promotion efforts, media impact on health, and basics in health communication methodology and research. Students will consider source, message, and receiver aspects of health communication as well as cultural and illness-specific issues. Prereq: COSI 101. PSCL 350. ** Behavior Genetics. 3 Units. Examines the impact of both nature and nurture on human behavior. Basic quantitative genetic methodology will be covered. Current family, twin and adoption studies in the areas of personality, intelligence, alcoholism, criminality, and psychopathology will be reviewed. Recommended preparation: PSCL 101. PSCL 379. ** Neurodevelopmental Disabilities. 3 Units. PSCL 375 – Research Design and Analysis. 3 Units. COSI 305 – Neuroscience of Communication and Communication Disorders. 3 Units. The course focus is neuroanatomy and neurophysiology related to motor control and cognition, particularly aspects of cognition involved in language functions. Topics to be addressed include: principles of neurophysiology and neurochemistry; functional neuroanatomy of the central and peripheral nervous systems; neurological and neuropsychological assessment of communication; neurodiagnostic methods. In part, the course material will be presented in a problem-based learning format. That is, normal aspects of human neuroscience will be discussed in the context of neurological disorders affecting communication. PSCL 397 or COSI 390. Independent Study. 1 – 3 Units. Individual study involving specific neuroscience programs. Prereq: PSCL 101. This pathway is intended for those considering a career in research. Areas include academic (e.g., professor), nonprofit (e.g., National Institutes of Health), and public/private organizations and institutions (e.g., hospitals, government, military). PSCL 375. ** Research Design and Analysis. 3 Units. PSCL 315. Social Psychology. 3 Units. Empirical studies of typical human responses to situations. First impressions, attitude change, effects of cash incentives, behavior in emergencies, interpersonal attraction, impression management, crowding, stress, vices. Recommended preparation: PSCL 101. PSCL 350. Behavior Genetics. 3 Units. PSCL 357. Cognitive Psychology. 3 Units. How individuals encode, store, organize, and use information. Pattern recognition, attention, memory, and problem solving. Recommended preparation: PSCL 101. Individual study involving specific programs of reading, research, and special projects. Prereq: PSCL 101.